The final prototype described in deliverable D9.5 is composed of a set of selected components that exchange and visualize intermediate data using the common data interfaces and formats, depicted by the schematics below. The involved components are subdivided into two categories: (1) the components involved in data processing, and (2) the components for the visualization of the intermediate and final data. For a detailed description of the functionality and usage of the software belonging to the final prototype, please refer to the Final Integrated Prototype Documentation [PDF]. The prototype allows the detection of the geometric differences between two point clouds or two meshes of the same environment acquired in different times. This prototype provides a tool for voxelizing triangle meshes as well as directly loading voxel scenes and subsequently compressing them using an SVO-based compression scheme. The Structure-from-Motion Environment compatible with the FSSR tool. The Scale-Aware Surface Reconstruction Tool, integrated in the Multi-View Environment. This prototype allows the computation of the Surface Light Field starting from a set of photos and a dense triangular mesh. HSGS is a high performance geometry simplification technology that allows reducing the size of 3D models made of millions of polygons/points in a few milliseconds. This prototype addresses the fast compression of point-cloud data including both geometry information and color information. This prototype showcases the effect of improved depth perception based on the chromostereopsis phenomenon. 3D Heritage Online Presenter is a collection of tools and templates for the creation of multimedia interactive Web presentations of digital 3D models. 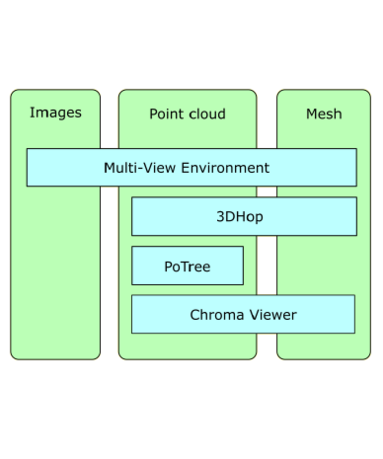 A Graphical User Interface for the Multi-View Environment. The code provides an implementation of Marching-Cubes isosurface extraction, supporting the use of Hermite Data. Fast L1 Resampling of noisy point data based on a probabilistic Gaussian mixture model. A simple algorithm to reconstruct smooth curves from samples in a plane. A prototype demonstrating in-situ collision detection of huge and dynamic point clouds at render time. This prototype allows aligning a set of unordered range scans of an object in a fully automated way. 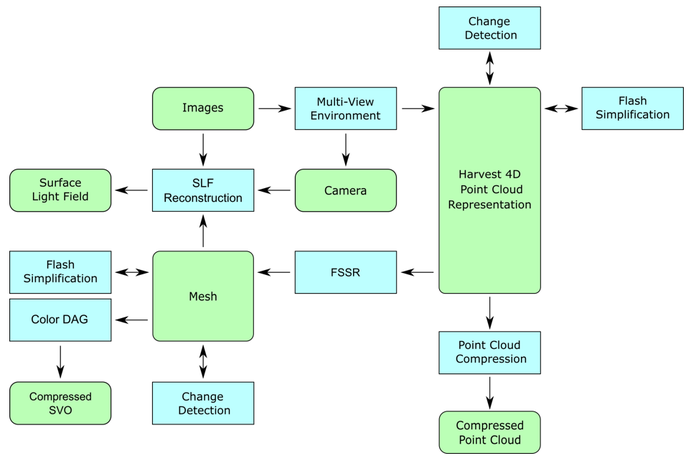 Estimates the 3D scene flow from stereo images recorded at multiple time instances. Performs morphological operations on 3D geometry, allowing for morphological filtering and medial surface extraction of 3D models. Demonstrating canonical-angle views in a virtual city environment. An interactive graphics application to perform advanced selections on 3D meshes. This prototype is comprised of an interactive modeling tool that allows loading 3D models, and quickly approximating them using the Sphere – Meshes method.